In this article, we will describe you how to download and install puppet modules to deploy for all our puppet agent nodes using puppet automation. Lets take an example to deploy "vim" packages on all our puppet agent nodes using puppet automation. Method 1 : Downloading the Puppet modules manually from forge website using the browser. 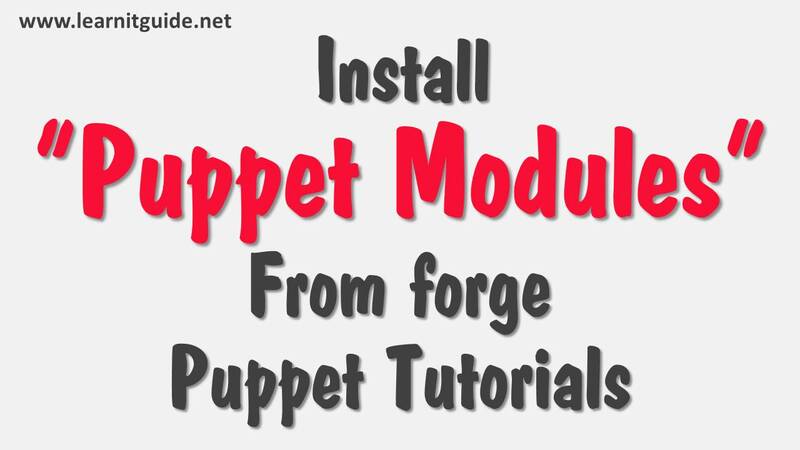 Method 2 : Download and Install the Puppet modules using the puppet module tool. Method 1 : Download and Install the modules manually from forge website using the browser. Open the browser and enter the url https://forge.puppet.com/ as image shows below. Enter the puppet module name “vim” at the search box and hit Enter. You will get more relevant matching modules. Click the appropriate one as you preferred. Note : Read the descriptions and compatibility carefully about the modules. Copy our downloaded puppet modules to the puppet master server. How to install the puppet modules from a downloaded tarball? Login into the puppet master server and execute the below command tool to install a module from a tarball. Assume that, you have saved our tarball "dhoppe-vim-1.4.0.tar.gz" on the folder /root/. Note : If you get any error related to dependencies, use the flag --ignore-dependencies along with the command as below and install the dependencies manually later. How to use the installed puppet modules to deploy on puppet agent nodes. If you would like to deploy only on the particular puppet agent nodes. Define the node name as below. Verifying the status at the puppet agent nodes. Now go to the puppet agent node “puppet-agent” and run the below command manually to override the default refresh interval or just wait for the interval to fetch the manifest file for changes. Once the changes are applied, verify the "vim" package is installed or not using the below command. Method 2 : Search and Install the modules online. Login into the puppet master server and execute the below command tool to search first and install a module from internet. You will get an output for the search you have done. From the example i am going to install the module "cornfeedhobo-nano"
Thats all about how to install the puppet modules offline and online and how to use the pre-existing puppet modules to manage our infrastructure servers. Understand the basics of puppet manifests files with examples? Understand the basics of puppet Modules?